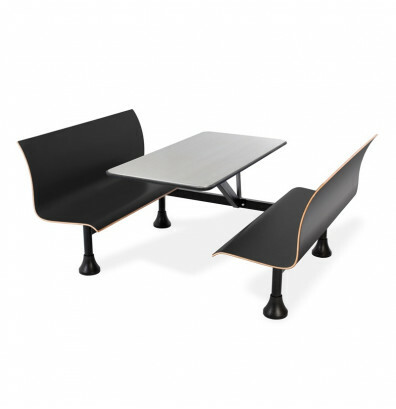 OFM 1006W cafeteria table with benches offers a durable stainless steel surface. Wall support configuration allows entering from one side. Available in multiple bench colors. OFM 1006W 24" D x 48" W cafeteria table with benches features a stainless steel tabletop for long-lasting appeal. Contoured plywood bench seating with a laminate finish. The side support under the table allows entering from one side of the benches for positioning the table against a wall. Heavy-duty steel frame and adjustable foot glides. Weight capacity of 500 lbs. per bench. This OFM cafeteria table is available in black (BLK), blue (BLUE), or red (RED) bench colors. Also available in a center support configuration for positioning the table in a middle aisle (OFM 1006M).